The Supreme Exodus - Behind the Wall - 13th Havana Biennial - Sunday, April 14th. Thirty Cuban artists will be present, among them some National Prizes of the Plastic Arts such as Pedro de Oráa, Pedro Pablo Oliva, Roberto Fabelo and Eduardo Ponjuán; and forty foreign artists from 14 countries, including Antonio Jose Guzman (The Netherlands - Panama), Javier Marín (Mexico), Enrique Martínez Celaya (Cuba-United States), Laurent Grasso (France), Grimanesa Amorós (Peru-United States), José Dávila (Mexico) and Per Inger Bjorlo (Norway). Most of The Supreme Exodus research in Japan involved learning on how to accept where I’am in my artistic journey and to appreciate the project for what it is, not what I want it to be. The wabi-sabi philosophy parallels my ongoing journey as an artist developing continuously my artistic practice. 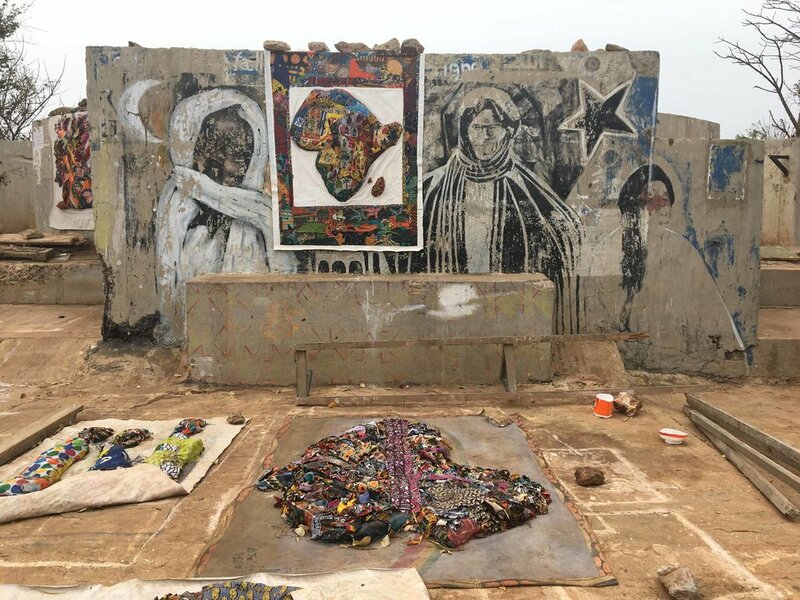 In Dakar, Senegal with Atelier GF Workstation: Producing costumes, investigating West African textiles and research on the legendary Dakar Laboratoire AGIT’art, for our performance at the Havana Biennial 2019. LABORATOIRE AGIT’ART - founded in Dakar in 1974, was a revolutionary and subversive art collective that sought to combine traditional African performance and creativity with a modern aesthetic. Established by the artist Issa Samb, the filmmaker Djibril Diop Mambéty, painter El Hadji Sy and the playwright Youssoupha Dione, Laboratoire Agit’Art started an interdisciplinary collective, devising street performances, improvisational happenings, installations and workshops. 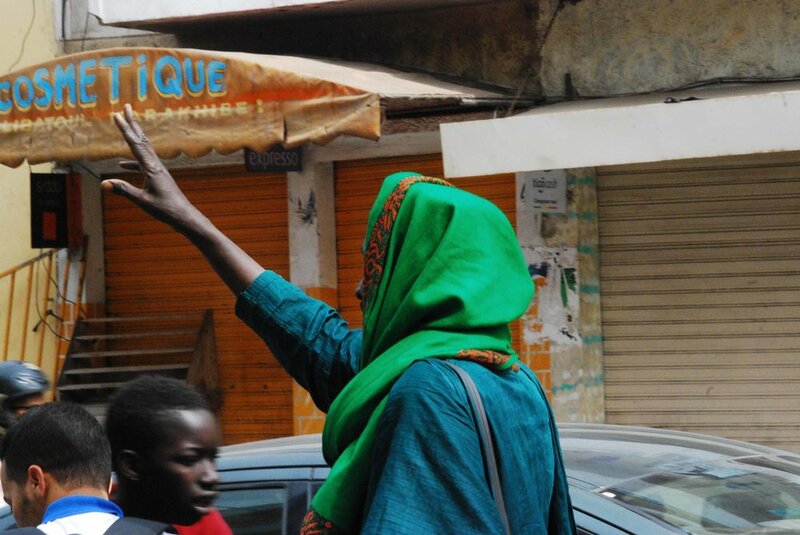 Although diverse in their practice, they were united in critiquing and challenging the prevailing négritude philosophy in Senegal. Their outlook was political, and community focused, publishing manifestos and creating installations out of street detritus that raised issues about African contemporary society. Today Laboratoire Agit’Art are considered to be one of the most influential African art collectives of the twentieth century. The Supreme Exodus: Masquerades - Négritude Movement - Laboratoire Agit-Art - Afro Latin American Art. Dakar Team: Iva Jankovic, Samba Thiam, Ibou Sane. 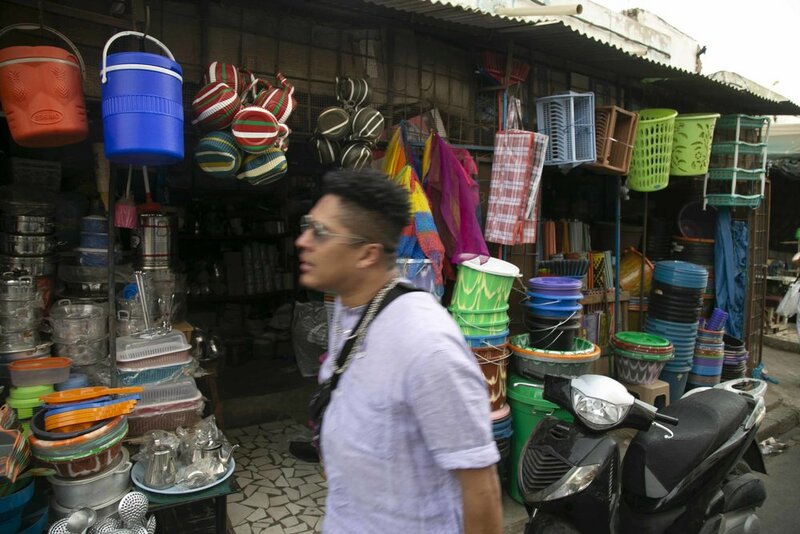 Afro-Asian Threads: Indonesian Batik, Japanese Shibori, West African Indigo dyeing textiles and Prints, from Tokyo to Dakar. 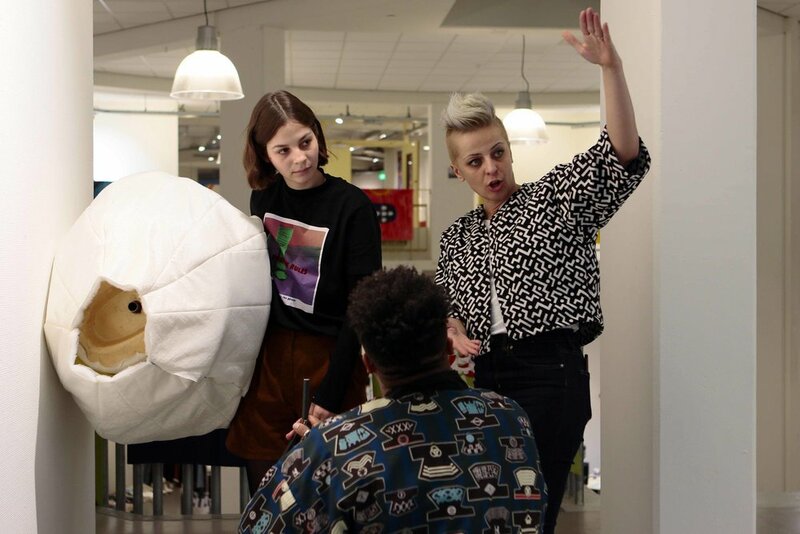 In collaboration with Groninger Museum, Curator Suean van der Zijpp (Groninger Museum), Minerva Art Academy, Iva Jankovic and the Prince Claus Conservatorium (Hanze University of Applied Sciences). 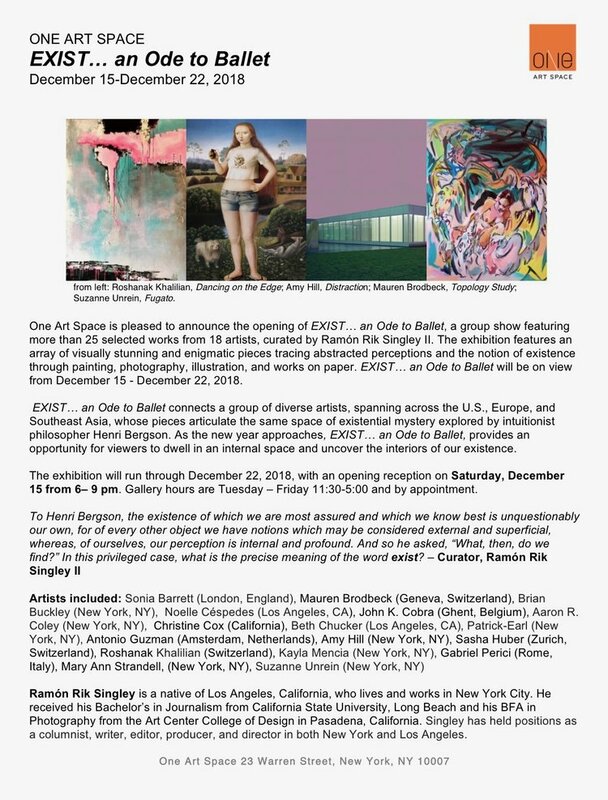 This important show to end the year is comprised of video, paintings, illustrations & photography from these artists hailing from the U.S. and Europe. This show is going to be a visually stunning foray of works as we end this year and peer into 2019 with new dreams and aspirations. We look forward to seeing you! To Henri Bergson, the existence of which we are most assured and which we know best is unquestionably our own, for of every other object we have notions which may be considered external and superficial, whereas, of ourselves, our perception is internal and profound. And so he asked, “What, then, do we find?” In this privileged case, what is the precise meaning of the word exist? 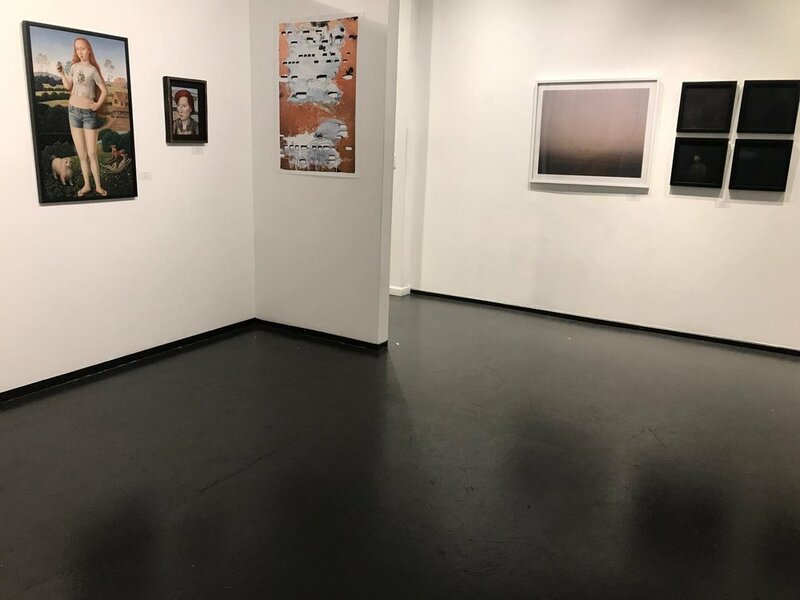 The voice and pagination of the works presented for this Group Show exhibition, for me, is a ballet; an ode to Alexey Brodovitch and his famed book of photographs in 1945, titled Ballet. This was the first and only book Brodovitch authored as a photographer, as he was primarily known as an Art Director for Harper’s Bazaar, Portfolio and other publications of the time. The images were of the famous Ballets Russes de Monte Carlo in the mid-1930s. To this day, Ballet is legendary and highly respected amid modernists and germane to the lexicon which helps to didactically explain the meaning of the beauty and importance of a well-composed image and its ilk. A big thanks to The Supreme Exodus Lab Groningen team and collaborators: Iva Jankovic, Sanne Boekel and Margriet Brouwer. 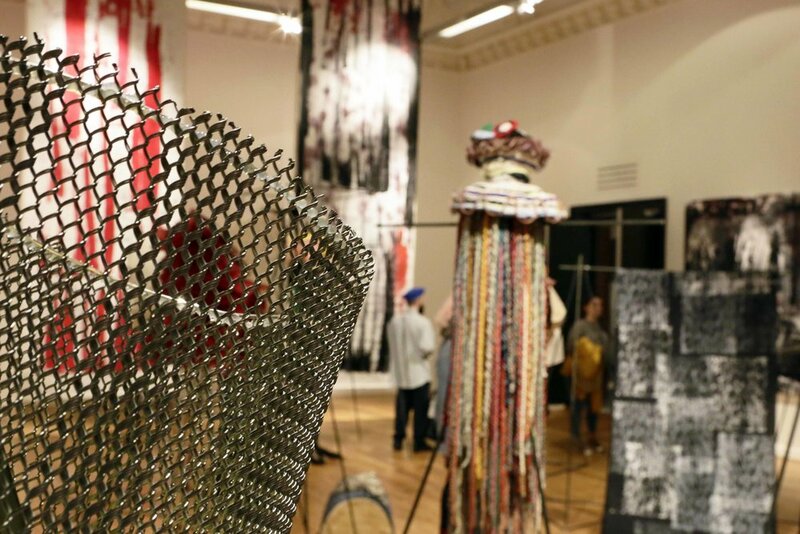 Last months students worked together with artist Antonio Jose Guzman to create an exuberant collection of costumes, masques and head pieces. Inspired by the ongoing project of Guzman on migration, DNA and origin, the students make costumes of the most diverse materials. The exterior of matrasses – symbolic for the items migrants take with them across the border-, folded paper, dolls and flags. In addition, fifty m2 textile is screenprinted to use in the costumes. In addition to the presentation in the Koepelzaal, the costumes will be worn in a procession during the Biennial of Havana in April 2019. The project is part of The Supreme Exodus, an ongoing project in which Guzman is inspired by the recent history of migration in Latin-America. Artist Antonio José Guzman constructed his monumental project from images of migration and demonstrations in Latin-America and the graphic image of his own DNA. He examines views on socio-cultural identity and migration problems. His installations can be seen as a data visualization of a continuous investigation into displacement and exile in Latin-America and the rest of the world. Antonio José Guzman is Artist in Residence 2018 at Minerva Art Academy. 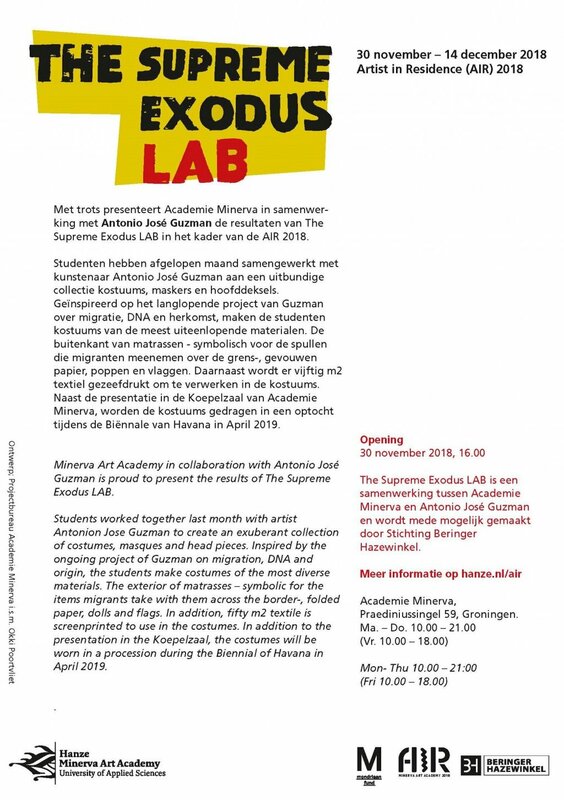 Minerva Art Academy in collaboration with Antonio José Guzman is proud to present the results of The Supreme Exodus LAB, on November 30th at 16.00. Four students of NAIP (Prince Claus Conservatoire) will perform during the opening; an improvisation on the visualised DNA of Guzman himself. On December 14th, the exhibition will end with a spectacular parade that starts at 15.00 at Praediniussingel 59. During this parade, students will walk in the costumes and students of NAIP will perform their music on the spot. Students worked together last month with artist Antonio Jose Guzman to create an exuberant collection of costumes, masques and head pieces. 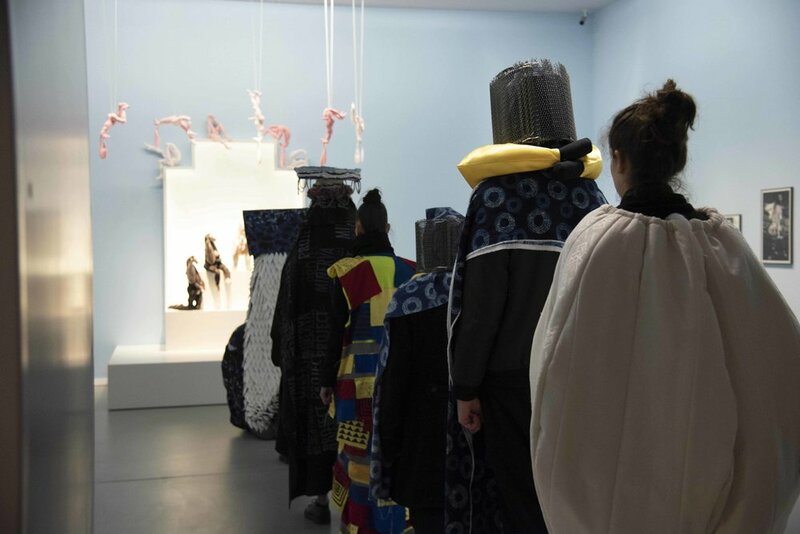 Inspired by the ongoing project of Guzman on migration, DNA and origin, the students make costumes of the most diverse materials. The exterior of matrasses – symbolic for the items migrants take with them across the border-, folded paper, dolls and flags. In addition, fifty m2 textile is screenprinted to use in the costumes. 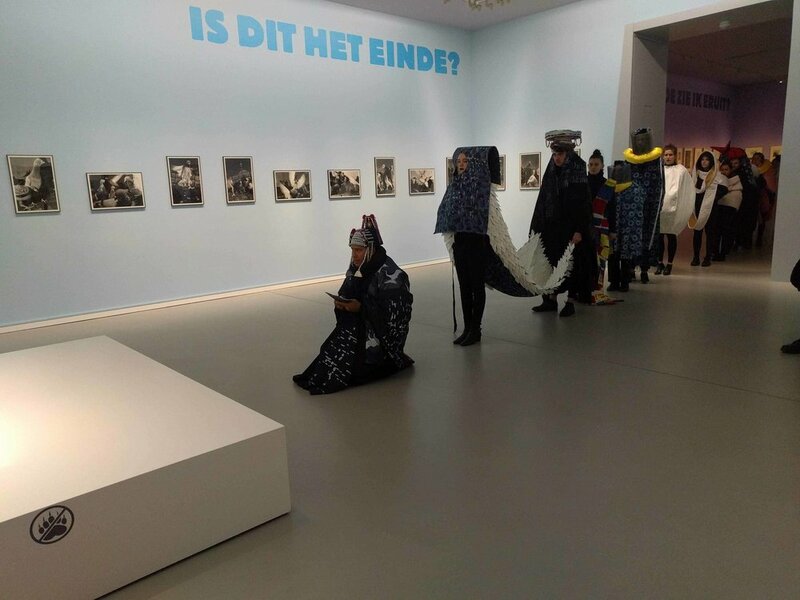 In addition to the presentation in the Koepelzaal, the costumes will be worn in a procession during the Biennial of Havana in April 2019. Each year in 2017, 2018 and 2019, Minerva Art Academy invites a different international top artist (Fine Art or Design) to work as an Artist in Residence. The AIR-project takes place at some of the workshops, for example metal or electronics, as part of the study programme. A learning and inquisitive working environment arises through the link with the artist in residence. Students and the AIR work together in an intensive research in which physical experiments are conducted. These experiments lead to a joint result and can be the starting point for new research. Atelier GF Workstation is in Tokyo doing our pop-up Transcultural Transit Talks. Our talks are a ephemeral experience that allows people to communicate with us in a collective experience centred around creativity, sound and technology. Our pop-up experiences are ephemeral by their very nature. They last for only a brief period of time. They are transitory and as a result, exciting and compelling. 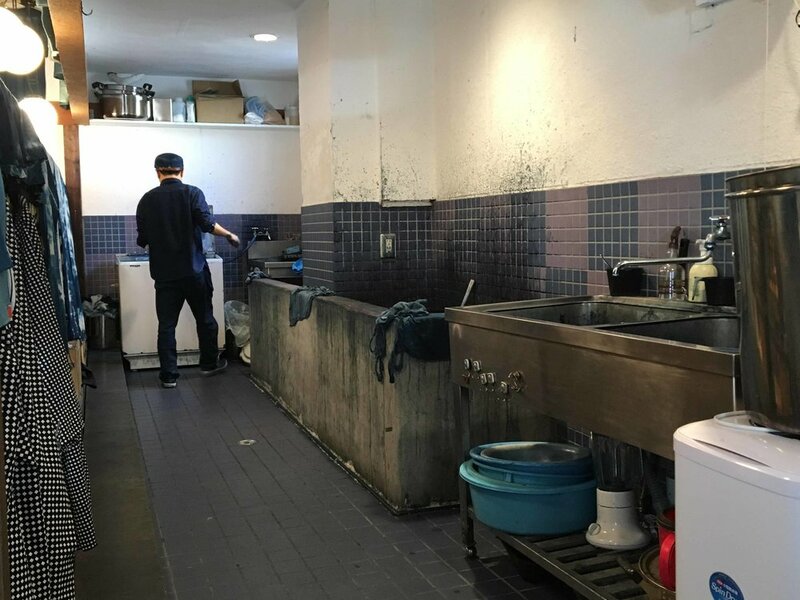 The Supreme Exodus “Tokyo Transit Talks and Impromptus” create a sense of urgency and interrupt daily routines to explore our transcultural motivations. 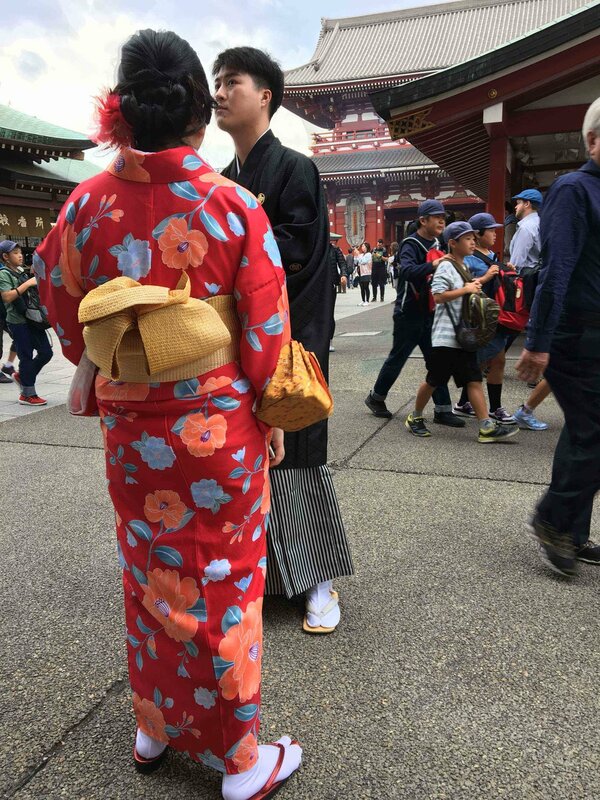 We meet different art initiatives in Tokyo and talk with artists on the streets of Asakusa. 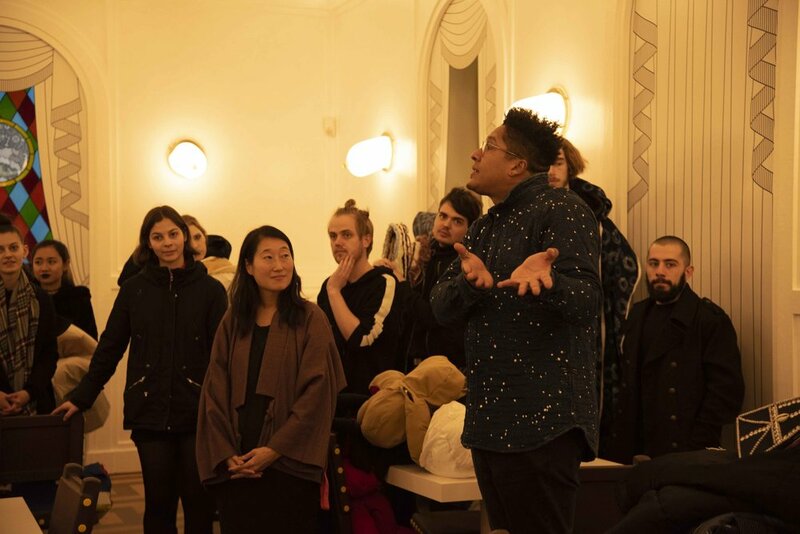 Our goal is to assemble ideas and talks with groups in Tokyo and Dakar that understand the unique and diverse history of art & textiles into our creative processes, from a wide variety of disciplines, cultures and backgrounds. 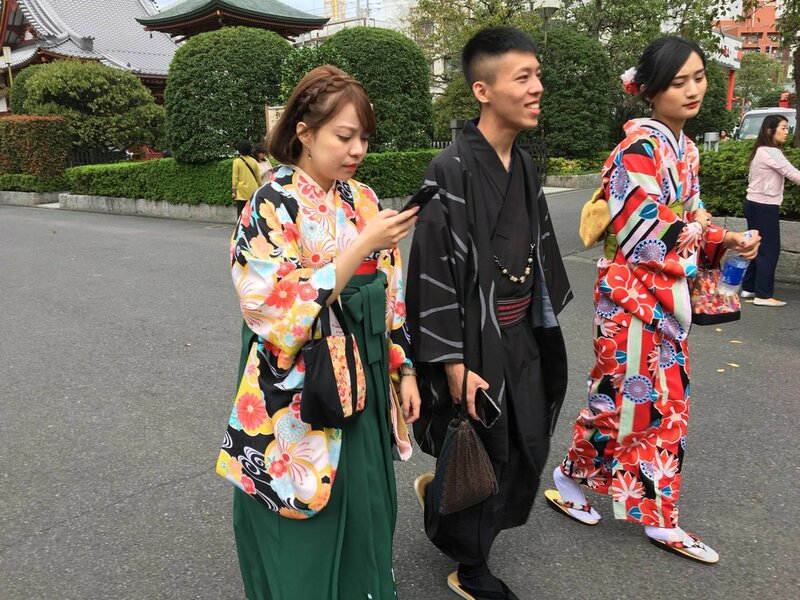 with Japanese artists and Kimono designers. Asakusa (浅草) is the center of Tokyo's shitamachi (literally "low city"), one of Tokyo's districts, where an atmosphere of the Tokyo of past decades survives. Arts Initiative Tokyo [AIT] Office - Shibuya-ku, Tokyo, Japan. Arts Initiative Tokyo (AIT) a not-for-profit independent collective of curators and art administrators based in Tokyo, Japan. It is especially concerned with contemporary art. It was founded in 2001 by six curators and arts administrators: Yuko Ozawa (Director), Yoko Miyahara (Mori Art Museum), Keisuke Ozawa (independent curator, Associate Director Art Fair Tokyo, lecturer Joshibi), Yasu Nakamori (Curator, Lecturer, Houston), Fumihiko Sumitomo (independent curator) and Roger McDonald (independent curator, lecturer Meiji University, Joshibi). Arts Initiative Tokyo アーツイニシアティヴトウキョウ TEAM: Yuko Shiomi, Roger McDonald, Naoko Horiuchi, Akiko Hida, Rie Okuma, Rika Yoda, Shintaro Tokairin, Shoko Aoki, Akane Kawaguchi. SOMA was founded in Mexico City in November 2009 at the initiative of a group of artists who had joined forces, resulting in a unique platform in the cultural field. Mexican artist Yoshua Okón’s videos blur the lines between documentary, reality, and fiction. He collaborates closely with his actors (often amateurs who are also the subjects of the work) to create sociological examinations that ask viewers to contemplate uncomfortable situations and circumstances. Koichiro Osaka (b.1979, Hokkaido, Japan) is the Founding Director of Asakusa, a Tokyo-based art space established in 2015. Osaka holds a degree in art criticism and curation from Central Saint Martins College of Art and Design, London. From Tokyo to Dakar! Afro-Asian Threads: Indonesian Batik, Japanese Shibori, West African Indigo dyeing textiles and Prints. 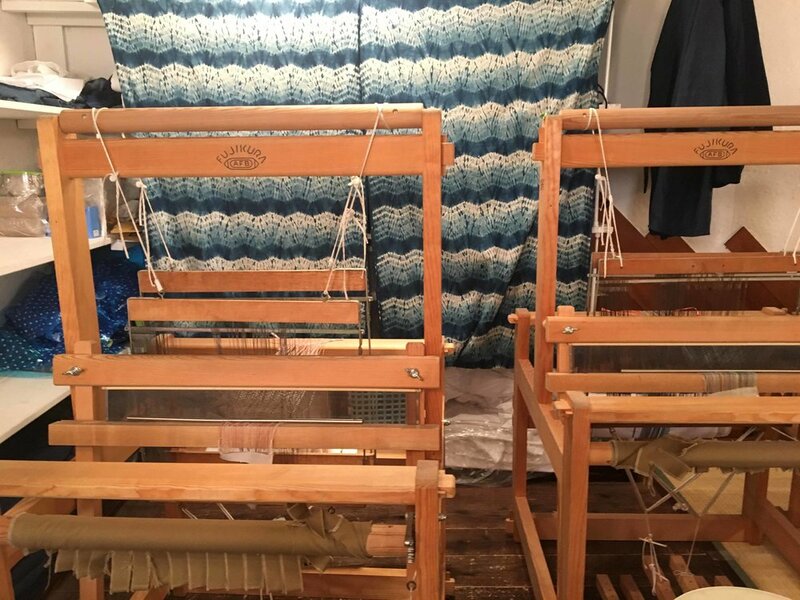 In Tokyo researching textiles based on Yoshiko Iwamoto Wada: Arimatsu to Africa: Shibori Textiles Developed for African Trade in 1948–49. Published in the Textile Society of America - 2016. A Situationist research Lab. Following basic principles of Situationist theories and perspectives. 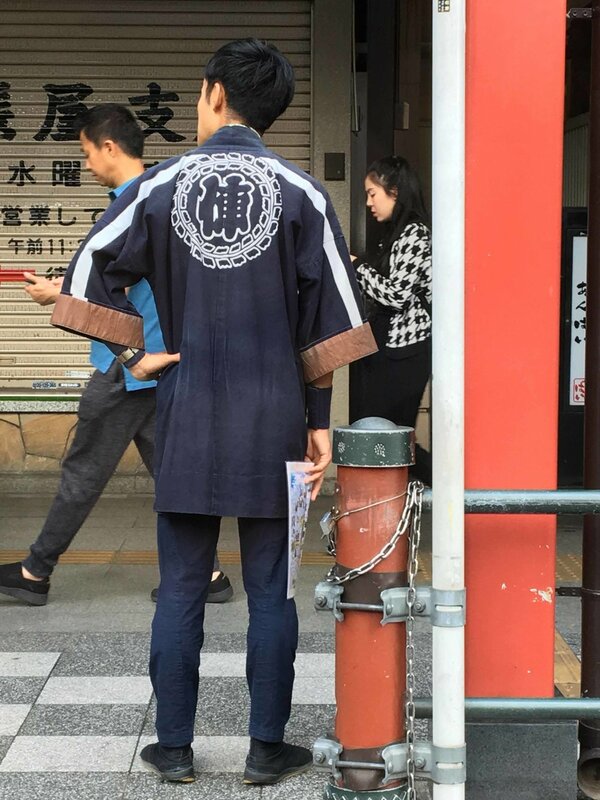 An experimental laboratory and field research in the streets of Tokyo. Researching textiles for customs to be develop in Minerva Art Academy Groningen, Dakar and Amsterdam for our performances at The Havana Biennial. 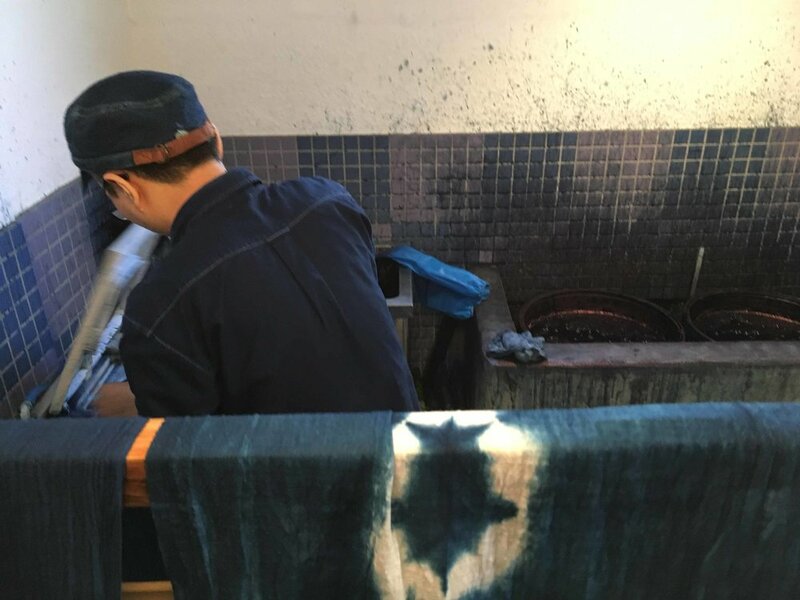 Aizome at Wanariya Indigo Workshops: Japan’s Ancient Art of Indigo Dyeing. Blue is one of Japan’s most loved and significant colors. 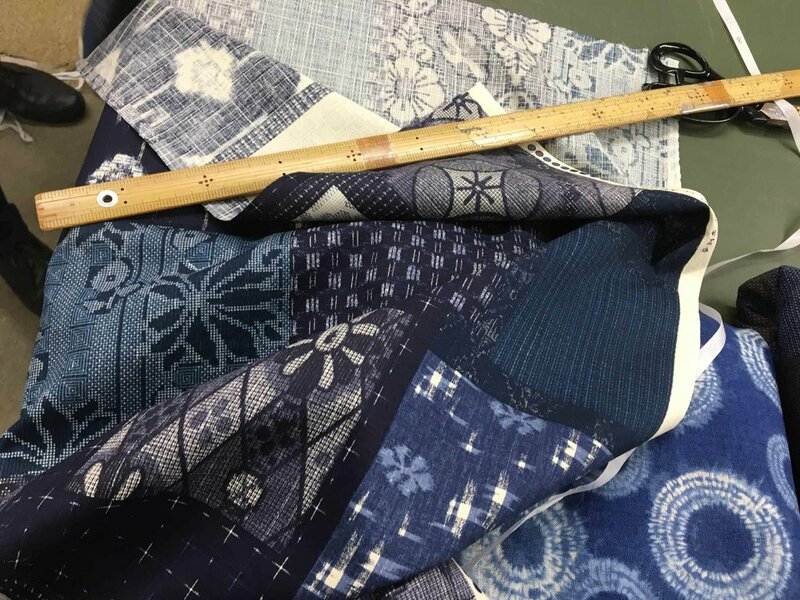 Specifically, the deep blue of indigo has been a popular kimono color since ancient times. 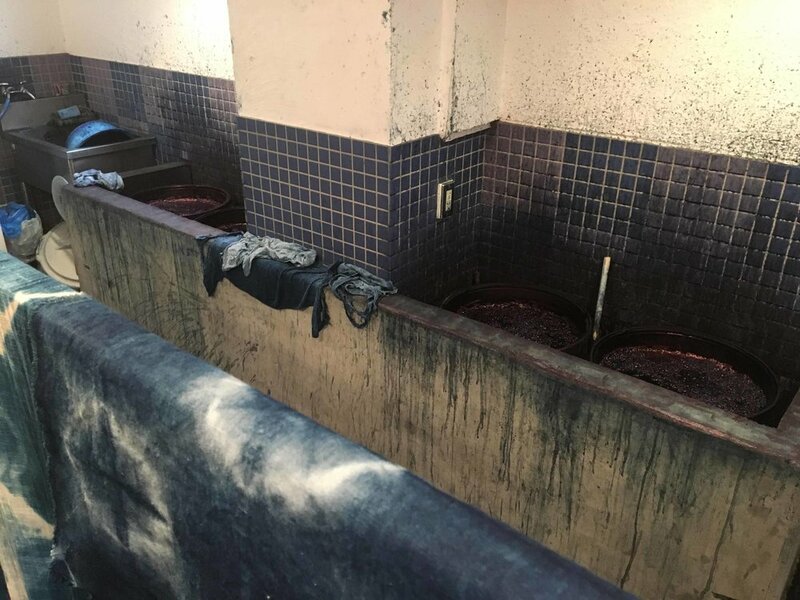 Japan has its own dyeing technique called “aizome,” literally indigo dyeing, utilizing a plant called “tade.” Aizome has been introduced to Japan in Nara period (710 – 794), and it is said that depending on different factors, such as mixture and time, this Japanese indigo can be separated into a total of 48 different shades. Shibori binds the Japanese, the West Africans and Gujaratis - the tie and dye technique of fabric printing. The shibori art dating back to the eight century uses the same resist techniques used by the bandhani artistes in Kutch and Jamnagar districts of Gujarat. Some textile scholars think that Bandhani is older than shibori and was exported from India to Japan which mastered production, techniques in layout and design and that from Japan was exported to Africa during the colonial textile trades between Asia and Africa. The exhibition features new work by ten well-known Dutch artists and designers. 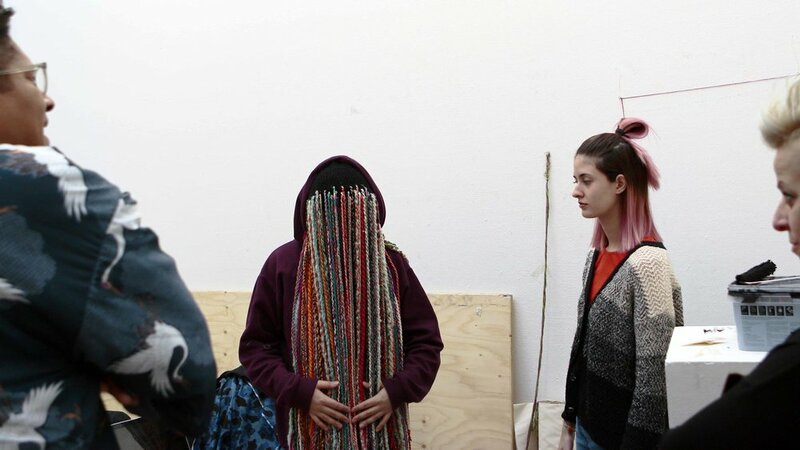 They participated in an artistic research project of the Textiel Factorij and traveled to India to work with Indian artisans with whom they researched on old traditions and new technical possibilities of textile. 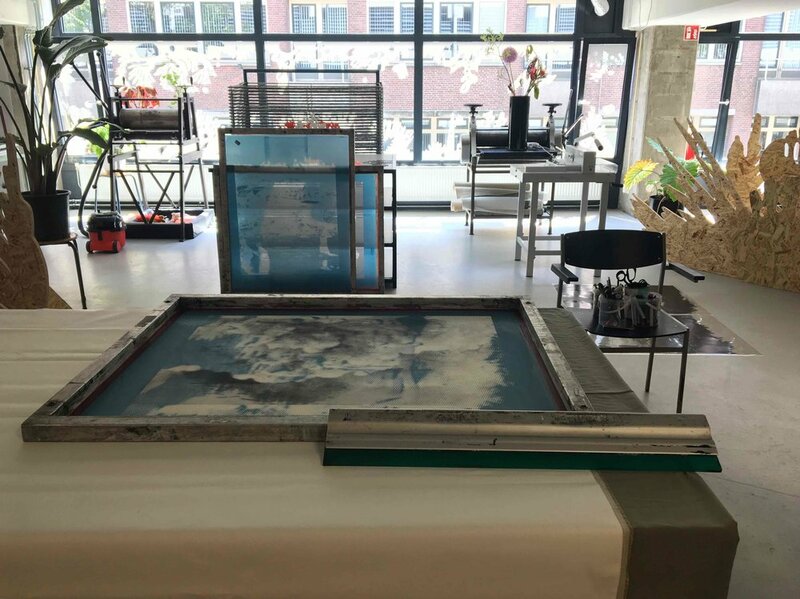 There are works by Aliki van der Kruijs, Antonio Jose Guzman, Iva Jankovic, Anastasia Starostenko, Gerard Jasperse, Gerard van Oosten, Esther Jongsma, Ruud Lanfermeijer, Sujata Majumdar, Lieselot Versteeg, Saar Scheerlings, Marloeke van der Vlugt, Marlies Visser and Meeta Mastani. The Textile Factory is an artistic research project based on the shared heritage of the Netherlands and India. In the days of the United East India Company there was a lively trade in Indian chisels: cotton painted with multicolored patterns. Dutch artists and designers worked in India together with age-old techniques and have thus given a contemporary interpretation to this cross-cultural exchange. The result: new designs that show an interaction between craft, design, dressing behavior and visual language in India and the Netherlands, in the past and present. The Textile Factory promotes sustainable knowledge exchange and contributes to the preservation of the shared cultural heritage. The Supreme Exodus Lab Introduction Lectures. The Supreme Exodus, is an ongoing project in which Guzman is inspired by the recent history of migration in Latin-America. 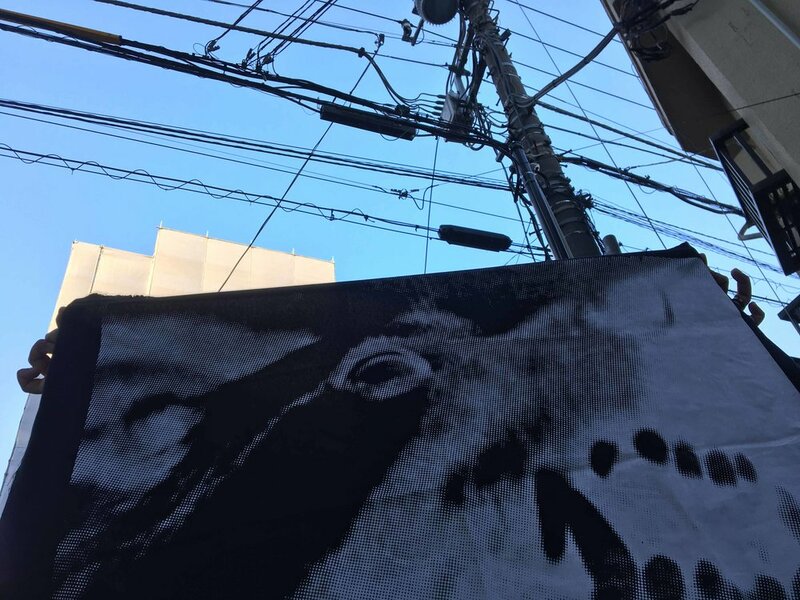 The artist constructed his monumental project from images of migration and demonstrations in Latin-America and the graphic image of his own DNA. He examines views on socio-cultural identity and migration problems. His installations can be seen as a data visualization of a continuous investigation into displacement and exile in Latin-America and the rest of the world. Artists: JASPER NIENS, BRIAN ELSTAK, ANTONIO JOSE GUZMAN, RASHEED VLIJTER, SANDIM MENDES, KEVIN OSEPA, MICKAEL MARTINS & CAROLINE ESCAFFRE, SARA NUYTEMANS, DOROTA GRABKOWSKA . On Friday 28 September, TENT presents a double exclusive: the opening of the exhibition ‘Who do you think you are?’ initiated by Rotterdam singer-songwriter Sabrina Starke, and the very first showcase of her brand new album ‘Underneath the Surface’. 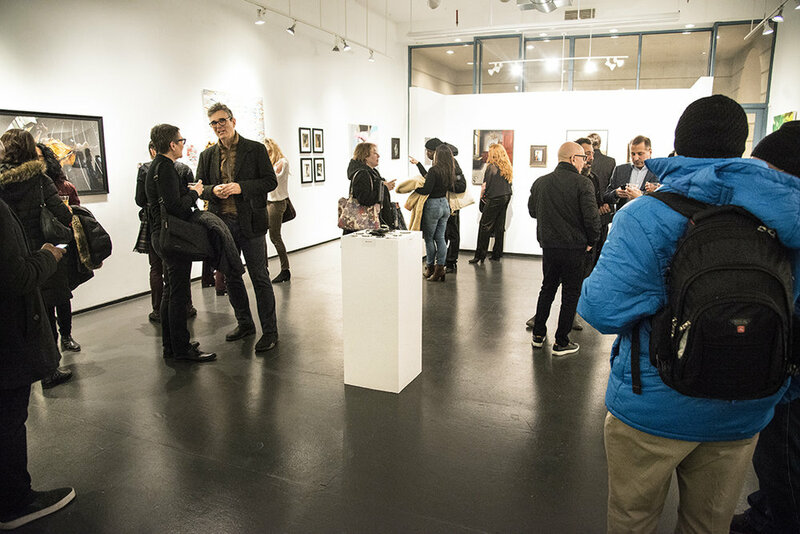 The exhibition features works by nine artists, seven of who are creating new artworks especially for the show. During the exhibition, TENT is presenting an exciting range of cross-disciplinary public programmes. The central theme of which is the many dimensions of identity. 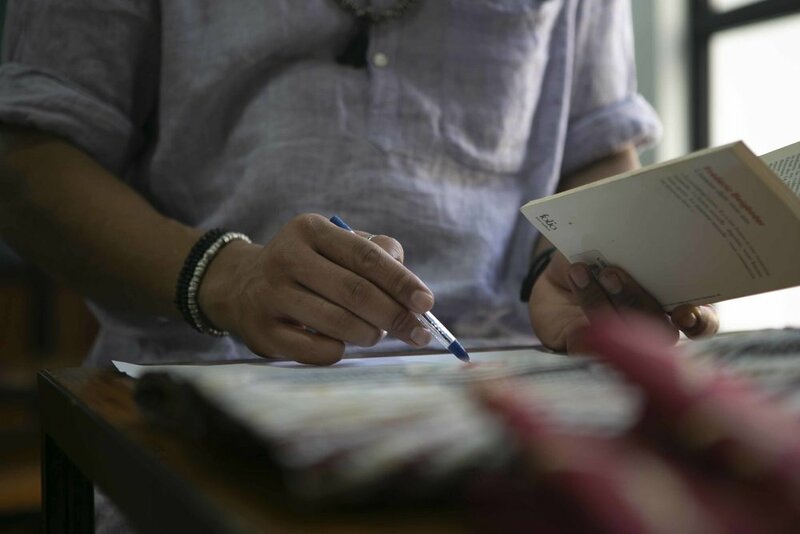 The programme aims to provide a positive stimulus into the search for new definitions of identity. In developing the exhibition, Starke worked closely with the advisor, artist, and curator Charl Landvreugd. Artist Jasper Niens’ impressive Under the Mango Tree installation is specially made for this exhibition. It is a pavilion that provides a meeting place for the public programme and the community. “Under the Mango Tree is inspired by the mango trees under which communities in Africa come together to share their stories with one another. A holistic and spiritual setting where everyone is welcome”, the singer enthusiastically explains. “It is a safe space, where stories, thoughts, and visions are shared.” The pavilion’s dome embraces the public and offers security through its circular forms. It is a technical masterpiece built using a unique system of steel and wood that Niens has been developing for two years and is now applying for the first time. In addition to Niens, there are also other artists, such as Brian Elstak, who takes inspiration from hip-hop culture and comics. He uses his pencil as a weapon and depicts an alternative universe to which the younger generation can identify. Dutch-Panamanian audio-visual artist Antonio Jose Guzman presents The Supreme Exodus, which combines images of Latin-American migration and demonstrations with graphic representations of his DNA. Starke is also providing a platform for young talents such as Rasheed Vlijter, Sandim Mendes, and Kevin Osepa. In the video installation Santos, Osepa contrasts contemporary life with the spiritual world. The public can also dream away in the clouds of design duo Mickael Martins & Caroline Escaffre, or savour a new installation about self-healing powers by Sara Nuytemans. With the work of Dorotha Grabkowska named “What made me”, participants can share emotions, thoughts and inspiration. ‘Who do you think you are?’ is an initiative by Sabrina Starke and realised in collaboration with TENT and Charl Landvreugd. This project is made possible by Arminius, the Mondriaan Fund, CBK-Rotterdam, Rotterdam Festivals and The Art of Impact. Latest news on A.J. Guzman. Browse news, articles and commentary archives. the supreme exodus "on the road to Havana"